Unit : 15th Battalion Australian Infantry, A.I.F. For most conspicuous bravery and devotion to duty when in action with a Lewis gun section. His company met with determined resistance from a strong point which was strongly garrisoned, manned by numerous machine-guns and, undamaged by our artillery fire, was also protected by strong wire entanglements. A heavy concentration of machine-gun fire caused many casualties, and held up our advance. His Lewis gun having come into action and silenced enemy guns in one direction, an enemy gun opened fire from another direction. Private Dalziel dashed at it and with his revolver, killed or captured the entire crew and gun, and allowed our advance to continue. He was severely wounded in the hand, but carried on and took part in the capture of the final objective. 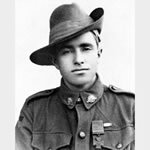 He twice went over open ground under heavy enemy artillery and machine-gun fire to secure ammunition, and though suffering from considerable loss of blood, he filled magazines and served his gun until severely wounded through the head. His magnificent bravery and devotion to duty was an inspiring example to all his comrades and his dash and unselfish courage at a critical time undoubtedly saved many lives and turned what would have been a serious check into a splendid success. Initiated into Duke of Connaught Lodge No. 3358 just before it moved from the English Constitution to the Grand Lodge of Queensland. Following the war he was back in Australia as an Engine Driver.